Grey-Grey belonged to someone else when she joined our family! I still don't know where she came from, but she showed up and seemed to fall in love with Nermal from afar. 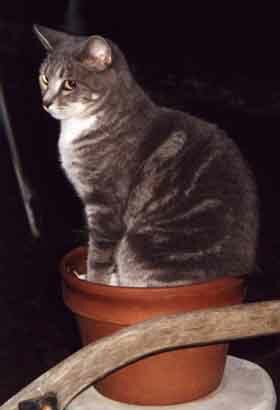 She wore a collar, was healthy, had been spayed and was the only girl-cat in the group. We finally adopted her when we couldn't find her original owner and she took to the yard like she had been born and raised here. Watching Grey-Grey interact with the "boys" has been a lesson in manipulation. She is the smallest of the group as well as the only female. For a time, Homer and I thought that the other cats were picking on her since she seemed to screech a lot and come running to us like the male cats were trying to kill her. However, when we watched, unobserved, from a window on several occasions, we noticed the Great Setup taking place. 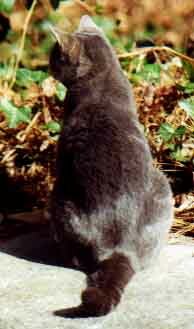 Grey-Grey would stalk the male cats, especially Nermal. She would taunt them, run in front of them and sit in their space like the yard belonged to her. Once they would turn to even LOOK at her, she would screech and run to the house screaming for help. The poor guys walked around looking confused all the time...while Grey-Grey gave the secret kitty-smile. Grey-Grey's favorite things: running from Nermal, greeting me at the car when I come home from work, flirting with Homer. 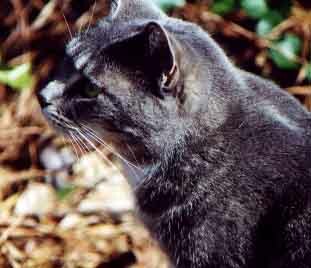 She taunts Nermal and stalks him through the yard, leaping into the air as he runs by. Grey-Grey has now been adopted by a loving family. Return to Top of Page. All images, essays and poetry are copyrighted: 1990 - 2016. Commercial Use of material on this site is prohibited.